The Trump administration is following through on its threat to bar America’s doors against people fleeing violence and persecution. Trump’s cruel words are matched with devastating deeds, snuffing out America’s light of liberty in many corners of the world. 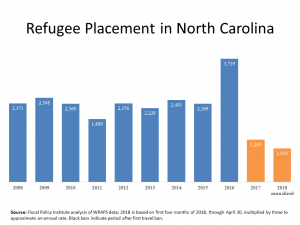 A new report from the Fiscal Policy Institute shows how dramatically refugee resettlement has declined on Trump’s watch and provides compelling evidence that we are turning away the very people that have long made America the economic power of the world. Beyond documenting how dramatically the Trump administration has reversed America’s history offering safe harbor to people facing persecution the world-over, the report shows that these policies will hurt the U.S. economy. Refugees tend to be more loyal employees: Most business owners reported that, once hired, refugees tend to stay in their jobs longer than other workers. As any employer will tell you, replacing good employees is expensive and challenging, so having reliable refugees as part of a workforce can be an enormous plus. Successful refugee hiring can help employers find more reliable workers: Once companies figure out how to successfully support refugees as they become employees, these businesses often find it easier to recruit more people from refugee communities. Just as with retention, finding skilled and dedicated employees efficiently can be an enormous boon for businesses. Turning our back on people facing war and torment is wrong, and this moral failing will come with economic ramifications now and into the future.